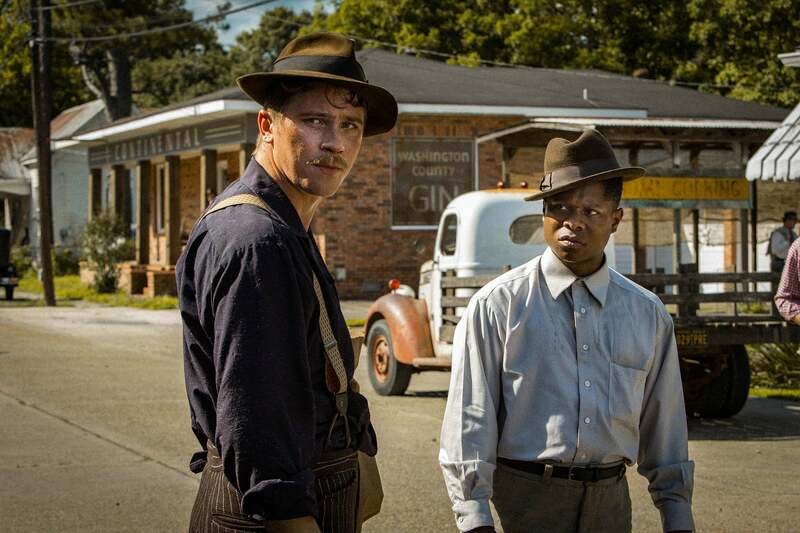 Mudbound chronicles the stories of two families — one Black, one white — pit against each other thanks to a white capitalist social hierarchy that renders them both at the bottom, but thanks to white supremacy, still at odds with each other. The McAllan family has moved to Mississippi from Memphis where Henry (Jason Clarke) goes out to make the most of shared farmland of the Mississippi Delta. This land is shared with the Jacksons, sharecroppers who have worked the land for generations with Hap (Rob Morgan) holding onto the dream that one day he’ll be able to buy land of his own. Both families are impacted by World War II. Henry’s brother, Jamie McAllan (Garrett Hedlund) and Ronsel Jackson (Jason Mitchell), Hap’s son, went off to war. Upon their returns, they strike a friendship. Each returns with their respective troubles reintegrating into civilian life, but Jim Crow makes one’s troubles far more severe than the other. Director Dee Rees is democratic in terms of narrative. Through the use of voice-overs, we hear of era-specific troubles from both Black and White perspectives. That said, though this film has been lauded by critics for examining racial strife of yore that speaks to contemporary issues, one’s reception to this film may depend on where you fall on said strife and how fed up you are about it. Film critics – who are majorly White – have lauded the film and will laud the film because the themes of racism are “important” to cover. As for the rest of us, well, we’re quite familiar with such subject matter, aren’t we? We live in a country that elected a racist, xenophobic, sexist demagogue who has made his disdain for Black people clear for decades. A sophomoric political amateur who ran on a slogan that loosely translates to making White people feel good about being White and won thanks to an electoral college with a racist history. And upon winning, he staffed his administration with White supremacists. Rees’s lends voice to all parties involved, but frankly, I am tired of these sad lil’ tales about the po’ White folks who do the worst to us because they’re broke. As we see in this film and from the past election, they put their whiteness above their well-being. They’d rather kick us down than join us to go at the real idiots. I felt tired by the end of this and wondered what exactly was I supposed to take from it. After more than two hours of watching Black people be beaten up in a myriad of ways — including mutilation — to wrap everything up with some schmaltzy reflection about making love, not war, was frustrating. This film does a phenomenal job of reminding you that the more things change, the more they stay the same. One thing that has changed is Mary J. Blige, who has blossomed dramatically as an actress. That is the biggest treat of the movie. Still, though Mudbound may be essential viewing for the clueless, but I wonder if Black viewers will be triggered by the film presenting another depiction of how whiteness works to make sure Black people know their place.